More and more women are trying new ways of retaining their youthful appearance or trying to make themselves look younger. As research continues companies are keeping up with demands by introducing new methods of achieving this. Botox is now used regularly by women everywhere of a variety of ages and is becoming increasingly affordable and accepted as a routine method of eliminating signs of aging. Botox is a derivative of the illness botulism which was found to be a leading cause of bacterial poisoning sourced from bad food products. The botox derivative of botulism is a protein compound, which when used in tiny amounts can freeze the tiny muscles around the face. As we age the muscular movements that we perform during speech or expression cause the breakdown of collagen which is the substance that provides elasticity and suppleness of the skin layers. A lack of collagen can cause the skin to sag or crease so Botox is injected to fill the area and freeze the muscles concerned by blocking the nerve signals between the brain and the muscles. Botox is a less invasive method of evening out fine lines than having a full face lift. It is not permanent so if results are not satisfactory other methods can be sought, but it does take immediate effect. As the administration of Botox is very fast, normal activities can be resumed immediately and no time has to be taken off work, no bandages are necessary and there should be no ill-effects afterwards. Botox is given through very fine needles that can be injected at the exact site of requirement for example fine lines or crow’s feet.This procedure may be a little uncomfortable but as the needles are so fine this should not be too much of a problem and is usually tolerable. The person who administers the injection MUST be trained in the procedure, know the correct dosage and how to give it cleanly and safely and dispose of the equipment appropriately. Always ask to see a certificate of competence and make sure they have insurance to cover their practice. It is advisable to find a practitioner who has plenty of experience and who has a good reputation.The injections take around 15 minutes from start to finish though this is variable depending on the amount of injections you are receiving and the areas to be injected. Although Botox has been certified as safe to use by the drug authorities, it may still be harmful if used incorrectly or administered wrongly.Do not use Botox on infected or broken skin or if you have any rashes or skin disorders.It may be likely that a small amount of bruising or tenderness may be experienced shortly after receiving the treatment but this should be minimal if any at all. It has been suggested that continual usage may cause the muscle fibres to thin permanently and side-effects can include weakness of the muscles which may lead to drooping of certain features such as the eyelids or eyebrows. Even though Botox is derived from a potentially toxic substance, it is given is such small amounts that it poses no risk to health. It is gradually broken down by the body and the procedure must be repeated every few months to maintain the visual benefits. 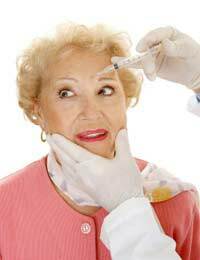 Botox has become extremely popular in recent years as a safer alternative to face lifts. It is not a permanent solution to fine lines and sagging skin, but appears to work well if updated every 3- 4 months. Blepharoplasty: is it Worth It?